The 3M Aqua-Pure Drinking Water Filtration System,DWS1000 is an economical undersink alternative to bottled water that connects to a dedicated faucet. This system reduces sediment, chlorine taste and odor, lead, cyst, mercury, asbestos, VOCs and MTBE. 1/4" push-in fittings and tubing included. Rated at 0.6 gpm flow rate and 625 gallons capacity. Includes polished chrome dedicated faucet and tubing. The product is tested and certified by NSF International against NSF 42 and NSF 53 for the reduction of the claims specified on the Performance Data Sheet. This 3M DWS-1000 Water Filter System is an original product from USA. It is suitable to be installed under the kitchen sink. With a standard installation, water is splitted from the incoming water tube (normally located in the undersink cabinet area), and feeds into the filtration system, and then comes out through a separate faucet. Also, for the installation of the filter faucet, one needs to drill a 9/16" dia. hole on the counter top. 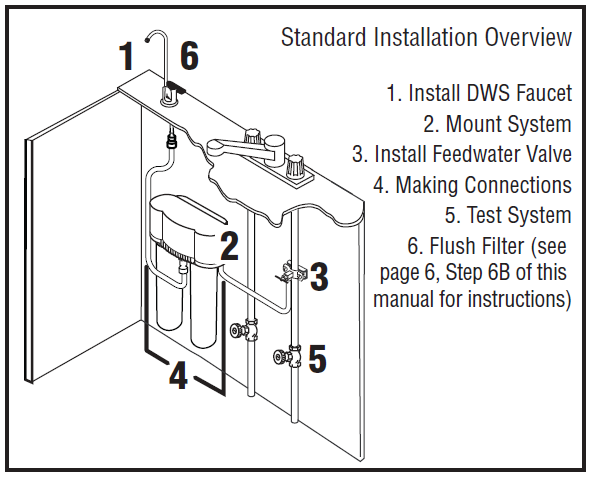 *** IMPORTANT: This is an under sink system, this standard package does NOT include any adapter to take the water from / to your main water tap. D.I.Y. : Please refer to the Installation instruction in the package. By Technician : Installation by a technician is only available in Hong Kong. If you would like to request an installation by a technician, please enter your preferred date in the comment section during checkout. Installation will only be done by appointments only. When choosing an installation date, please select a date at least 2 weeks from your order date to allow sufficient time for our technicians to schedule your installation. Upon receiving your order with installation date, we will get in touch with you to finalize the installation details. For more information, please contact us at cs@lotusmart.com.